The Aztecs defeated Stanford 20-17 after a game-winning touchdown late in the fourth quarter. The 40,000+ crowd at Jack Murphy was electric out of the gates. The vibe and environment were different from what most Aztec season regulars are used to. 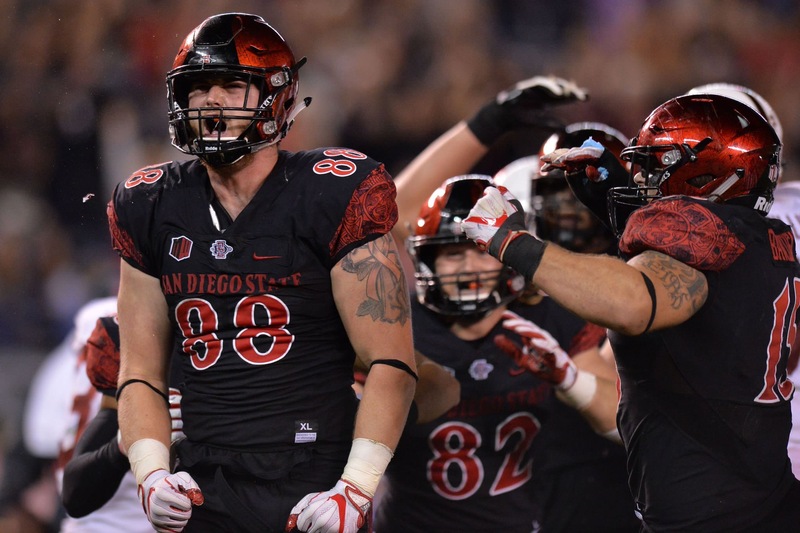 The Aztecs came into the game as nine-point underdogs to the powerhouse Stanford Cardinal. Stanford received the opening kickoff and the Aztecs’ defense shut them down to a three-and-out series after Noble Hall sacked Stanford quarterback Keller Chryst for a loss of eight yards. The Aztecs’ offense took over and drove down to the Stanford 29 yard line. It was fourth and two, and Rocky Long elected to go for it on a handoff to Rashaad Penny. Unfortunately, Penny was stopped short of a first down by a yard. The gutsy call proved Long was in the game to win. He figured they had a better chance of getting a first down with Penny than kicking 46-yard field goal. The game remained scoreless for the rest of the first quarter. The Aztecs’ defense held Stanford to only three yards for the entire first quarter. Long had his defense ready to play. The Aztecs put together a six and half-minute drive for 14 plays and 58 yards to score the game’s first points. The Aztecs were forced to punt at one point in the drive, but were saved by a running into the kicker penalty on fourth and five for an Aztec first down. John Baron II ended the drive with a perfect kick for a 43-yard field goal. Stanford’s next drive was a quick one, as on the third play, running back Bryce Love had a 51-yard touchdown rush. The Aztecs had a tough time stopping Love for just about the entire game. Love finished with 13 carries for 184 yards and two touchdowns. The score remained 7-3, a Stanford lead until there was 1:14 left in the first half. Stanford had the ball when Ron Smith intercepted a pass from Stanford QB Chryst. The huge interception by Smith put the Aztecs in a perfect position to take the lead before halftime. With the ball on the Stanford 15, two consecutive passes were completed to Kahale Warring to the four yard line. The next play was a touchdown run by who other than Rashaad Penny with 30 seconds remaining. Stanford took over and completed a 16-yard pass, which was followed by an unsportsmanlike conduct penalty against SDSU, which resulted in Stanford’s ball on the Aztec 25 yard line. 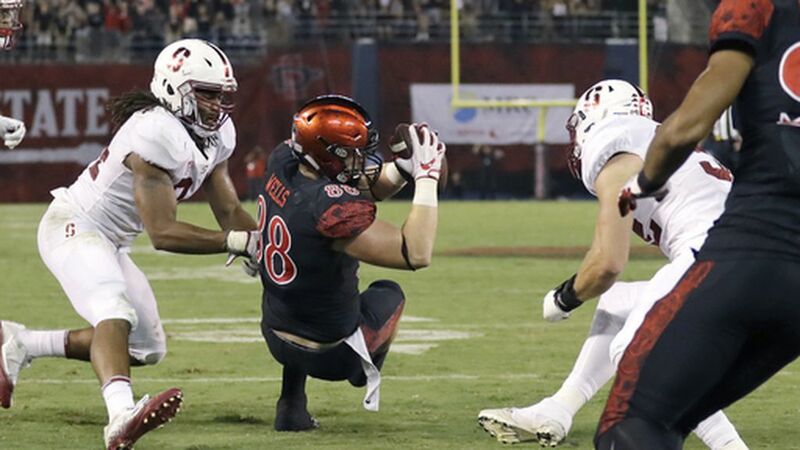 The Aztecs were saved when Kameron Kelly sacked Chryst and forced a fumble, which was recovered by the Aztecs. The Aztecs took a 10-7 lead into the half over Stanford. SDSU started the second half with another six and a half-minute drive capped off by a John Baron II 36-yard field goal. The Aztecs now led 13-7. The Aztecs came very close to getting a first down on 3rd and 9, on an 8-yard pass to Juwan Washington to the 12 yard line. After a substitution infraction penalty, the Aztecs kicked the field goal. Stanford came back with a 71-yard drive that resulted in a field goal, to pull back within three of the Aztecs. The Aztecs next series resulted in a punt, which allowed Stanford to take over with two minutes remaining in the third quarter. Stanford was moving the ball well when the quarter ended. The fourth quarter began with another explosive run by Bryce Love, who took a handoff 53 yards for a touchdown. Stanford took the lead 17-13 in the fourth quarter. The Aztecs took over and were driving the ball deep into Stanford territory, with effective passing for Christian Chapman, going 3-3 for 18 yards to start the drive. Rashaad Penny then had an explosive 36-yard run to the Stanford 20. A false start penalty pushed the Aztecs back to the 25 and the drive ended after Christian Chapman was sacked on third down all the way back at the Stanford 33 yard line. John Baron then missed a 50-yard field goal, and the Aztecs turned the ball over to Stanford, trailing by four. Aztecs forced a punt from Stanford and took the ball back with 6:15 left in the game, needing a touchdown to win. Christian Chapman needed to show up for easily the biggest drive of his career, and he certainly did. On third and seven he found Mikah Holder for a 16-yard gain, who was being guarded by his twin brother, Alijah Holder. Then Rashaad Penny ran for 11 yards to the Stanford 42 yard line as the Aztecs were gaining momentum. Then the lights turned off right as the Aztecs called a timeout. Fans were asked to wear black for a “blackout” against Stanford. With the lights going out, it was assumed it was a part of the hype of the “blackout”. The Aztecs’ chant of “I Believe” began throughout the stadium. It was an electric atmosphere and huge moment in SDSU football history. The delay continued on, and it was announced that there was an electrical problem. The delay lasted for 22 minutes before play resumed in the middle of the Aztecs’ biggest drive in history. Play resumed right where it left off with a Rashaad Penny six-yard run. The next play, Chapman threw a pass to Juwan Washington for a first down to the Stanford 24 with three minutes to play. Then on 3rd and five with a minute and a half to play, Chapman completed a pass to Holder all the way to the Stanford 8 yard line. The next play, Chapman dumped off a pass to tight end David Wells, who made a valiant effort to get into the end zone. He scored on a second effort and the Aztecs took the lead 20-17 with 54 seconds to play. The stadium erupted when Wells scored as the Aztecs were on their way to defeating the 19th-ranked Stanford Cardinal. On the first play of Stanford’s final drive, Kameron Kelly intercepted a pass from Chryst to seal the Aztecs victory. Kameron Kelly had a great game with six tackles, two sacks, and the game-winning interception. 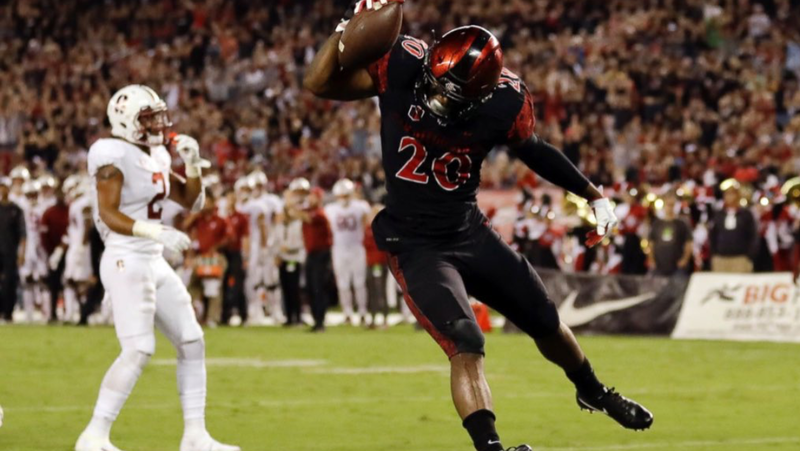 Rashaad Penny was a workhorse, with 32 carries for 175 yards and a touchdown. He also caught five passes for 31 yards. Christian Chapman was efficient, completing 21/29 for 187 yards, one touchdown, and no interceptions. Ron Smith added 7 tackles and a huge interception at the end of the first half to set up an Aztecs touchdown before half. Juwan Washington had eight carries for 30 yards, while also catching two passes for 20 yards. Mikah Holder had his best game of the season against his twin brother guarding him. He brought in 7 receptions for 85 yards, including two big third down catches in the final drive. David Wells had three receptions for 30 yards, including the game-winning touchdown catch. 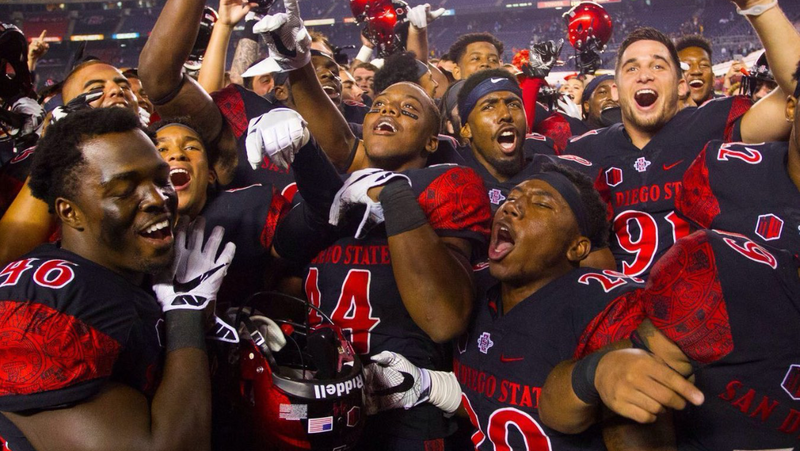 The win against Stanford is debatably the biggest victory in SDSU’s football program history. It also allowed the Aztecs to remain perfect on the season at 3-0 and move into the AP top 25 for the first time this season. The Aztecs are now rated 22 in the nation after back-to-back victories over Pac-12 schools, Stanford and Arizona State. The Aztecs add to their resume on their hopeful journey to a New Years Day Six bowl as the representative from the group of five conferences. The Aztecs have another tough contest next week as they travel to Colorado Springs to take on a tough Air Force team on the road. The Aztecs are the real deal, and are not letting down the city of San Diego as its football team.